Shakespeare has rightly said, ‘A light heart lives long’. There can be no greater everyday virtue than cheerfulness and our cheer can be vented through a smile or a laugh. The cliché ‘Laughter is the best medicine’ has deep overtones. Since time immemorial ‘vaids’ and Ayurvedic practitioners in India have stressed on the importance of laughter to lead a healthy life. Laughter therapy or ‘hasayog’ is an important component of healing through yoga. In ancient times, most Emperors and Kings had a court jester to make them laugh. Needless to say this diffused the tense atmosphere and helped people to come closer. Every circus has a couple of clowns to induce laughter and almost every Hindi film has a comic character to make us laugh at his antics. Humorous TV serials use recorded sounds of laughter at the appropriate place. It is a well-known fact that health and cheerfulness beget each other. Medical doctors, psychologists and psychiatrists all agree that chronically ill patients can benefit substantially from laughter. We all know how happy people get ill less often than those who are chronically miserable and anxious. Those who see the bright side of life and remain optimistic are unlikely to go down with stress-related disorders. Laughter in fact is the only method by which the residue air in the lungs can be replaced by fresh air. This leads to healthy living. The vast body of jokes and anecdotes which relate to the medical profession bear ample testimony to the psychological necessity of humor. A good laugh is a valuable tool in the workplace. Tension is unavoidable in business and humor is an unexpected release, a surprise. A good laugh can fritter away stress. Researchers have found that the more stress people are under the more they are ready to laugh. A good laugh is also looked upon as a motivational tool. After laughing you can begin a new thought process; it helps to set the mind in a different perspective. Many big and small cities in India have ‘laughter clubs’ where people assemble in the morning for a bout of laughing. There are over 200 such clubs in India, which was started in Mumbai. In Kolkata Dr. Madan Kataria founded the first Laughter Club. In most of these clubs, laughter has been moulded in the form of yoga. ‘Pranayam’, meditation and various fitness exercises are incorporated into the programme along with laughter techniques. This has become known as the laughter therapy or hasayog. Here is one set of rules often followed in such clubs. As soon as the instructor blows his whistle, the members must break into laughter, swinging their arms to and fro in the air. They must also take deep breaths at the same time. In the next step they have to keep their mouths closed and try to laugh without making a sound. This is useful for toning the skin, thereby preventing wrinkles, and massaging the abdominal muscles. In the third step, the members must laugh with their mouths open, but there must be no sound. This clears the lungs, curing breathing problems and asthma. The entire session ends with the recitation of the ‘om’ sound. Recent research has revealed that laughter reduces stress, burns off calories and improves digestion. It can reduce the heart-rate and stimulate the appetite. When we laugh we secrete hormones that stimulate the heart and act as natural painkillers. Laughter is also a release from anger. Freud believed that truth rides on the wings of humor. French neurologist Henri Rubenstein states in his research papers that laughter is the best relaxant there is, as even one minute of laughter can give the body up to 45 minutes of therapeutic relaxation. Laughter, it appears, has much the same effect on the body as regular physical exercise, in that the ‘high’ produced goes on working long after the exercise is over. Laughter is after all another form of exercise. 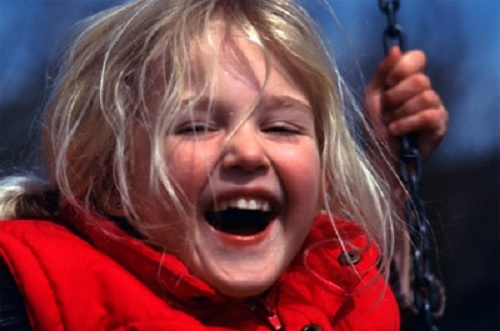 For people who are ill or confined to bed or a wheelchair, laughter may be the only exercise they may be able to take. According to researchers, 10 minutes of laughter is enough for the effects to last throughout the day. It was American Journalist Norman Cousins who shook the medical fraternity by discovering the healing powers of laughter. Doctors believe that laughter therapy is useful for those suffering from insomnia, depression, high blood pressure, joint pains, diabetes and other stress-related problems. However, they advise that it shouldn’t be followed by those afflicted with piles, glaucoma, hernia and chest pain. Pregnant women and people suffering from a severe cold and flu should also stay away. According to experts, 94% of the diseases are caused by stress and the rest by virus and bacteria. So if we can reduce the stress-related factors, the functioning of the body will improve. Experience has shown that as soon as a person laughs, the mind and body become free of tension. But when he is tensed, his blood pressure increases, affecting the heart, brain and kidney, leading to the mal-functioning of the entire system. Pierre Vachet, a French doctor who has studied the physiology of laughter for many years, has come to the conclusion that laughter expands the blood vessels, and sends more blood racing to the extremities. So those who suffer from cold hands and feet should perhaps try laughing instead of piling on socks and gloves. Laughter creates internal warmth. It is a smile that has burst. It relaxes and stimulates at the same time. As laughing sends more oxygen to every cell in the body, laughter can also serve to speed tissue healing, and stabilize many body functions, helping to strengthen them against infection and abnormal growth. Cheerful people, doctors say, resist disease better than glum ones. The frequency of common colds, sore throats and chest infections can get reduced if laughter therapy is practiced regularly. Many longevity experts agree that optimism and the ability to dismiss life’s innumerable irritants with a good sense of humor are two attributes shared by the oldest and healthiest of people. Laughing is known to stimulate the production of alertness hormones called catecholamines. These hormones in turn trigger the release of endorphins in the brain. These foster a sense of relaxation and well-being and dull the perception of pain. The psychological and physiological effects of laughing can be compared to ‘internal jogging’ – a kind of sedentary exercise. (4) By increasing the production of endorphins, the body’s natural pain killers. Arthur Stone, a Professor of Psychoneural Immunology at the State University of New York, who has pioneered research on the effects of laughter, has provided the most conclusive evidence yet of a link between laughter and immunoglobulin A, an antibody which helps fight illness by harmful bacteria and viruses. Another vital chemical triggered by laughter is cytokines, dubbed ‘happy hormones’. Some researchers also believe that laughter helps fight cancer. Dr. Robert Provine, a Professor of Neurobiology and Psychology at the University of Maryland, Baltimore Country, USA has spent years studying laughter. He has analyzed what, physically, a laugh is, what its vocal signature looks like, and how it differs from a spoken word. The average laugh consists of short rhythmic bursts of vowel based sounds, each lasting about 75 milliseconds and separated by rests of 210 milliseconds. Laughter also has the useful property of being contagious. How can you bring more laughter into your life? First examine those instances in which you get all worked up and irritated, and realize that there is another way to respond. See the lighter side of things. Associating with people who are naturally funny also helps. They can teach you to make light of circumstances beyond your control. Further, develop your sense of humor. Remember that it is always better to poke fun at yourself rather than taking shots at someone else. You can also keep a list of funny things, carry funny photos around, watch funny videos and so on. Making people laugh is an art and can be cultivated. Collect jokes, funny anecdotes, cartoon quips, humorous quotations etc and use them appropriately – in ordinary conversation, in your speeches, in social gatherings etc. Build a humor collection – buy books by P.G Wodehouse or anyone else which set you chuckling. Stick cartoons on your frig. Tape re-runs of comedy serials and watch them when you are down in the dumps. It is of vital importance for us to realize the myriad benefits of laughter. Most of us have almost forgotten how to laugh. On an average day, an adult barely laughs five times, whereas a child who has no tension, laughs 150 times. Laughter and the spirit of laughter should be incorporated in our life and living. Humor is the affirmation of dignity, a declaration of man’s superiority to all that befalls him. A sense of humor helps us to cope with the ups and downs of life. So let yourself go and laugh – and enjoy life to the fullest!